The first major release of the WP Security Audit Log plugin for 2019 is finally here! Now that the holidays are over, we are back in full swing and are happy to announce update 3.3.1 of the most comprehensive activity log plugin for WordPress. 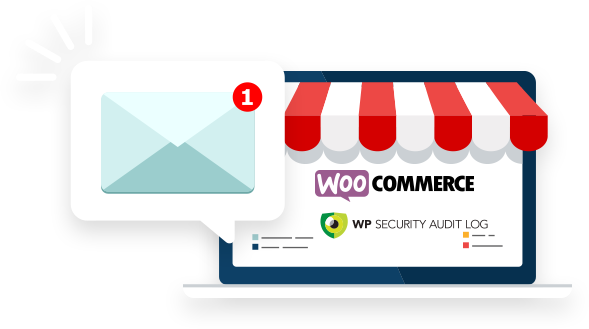 The main highlight of this update is the much improved coverage of WooCommerce, making WP Security Audit Log the ultimate WooCommerce activity log plugin. With this much requested activity log update WooCommerce store owners can keep a close eye on how store managers are managing the store, how orders are processed, who is issuing coupons or changing payment gateways, and much more! Let’s dive in and see what is new, improved and fixed in this exciting update of our activity log plugin. Refer to the complete list of activity log event IDs for WooCommerce store and product changes for more details about all the changes the plugin can keep a log of. Whenever a new order is placed in WooCommerce, or a user changes the status or details in an order, WP Security Audit Log will keep a log of such changes. Below is a list of event IDs the plugin uses to keep a log of WooCommerce Orders changes. Event ID 9065: Changed the coupon amount. Major performance improvement in event viewer: We have optimized the event viewer and now it takes less than 2 seconds to load events, even when the WordPress activity log contains more than one million events. Email notification on deactivation of plugin: The plugin automatically sends an email to the site administrator when it is deactivated. Several new hooks: This update includes three new hooks that allow you to manipulate the data before it is saved to the activity log database and before it is displayed in the event viewer. The three new hooks are wsal_event_id_before_log, wsal_event_data_before_log and wsal_auditlog_row_user_data. Refer to the list of hooks in WP Security Audit Log for more detailed information of how to use these hooks and code samples. Optimized the event viewer queries. You’ll notice a big difference in loading speed if you have a large number of events in the activity log. New plugin setting to configure the refresh rate and time of the live notifications in the WordPress admin bar. Event severity is now saved as metadata. This means that now we can use them for filtering, notifications and more. Excluded the default WordPress cache directory from the default WordPress File Integrity Scans. Improved the exception handling of incorrectly configured privileges during plugin install. For a complete list of what is new and improved in this new update of our activity log plugin for WordPress refer to the plugin change log. Whether you are running WP Security Audit Log free edition or the WP Security Audit Log Premium, you will be notified by WordPress that an update is available. We are always happy to learn about our users’ experience. If you have feedback, would like to see a particular feature or want maybe you’ve encountered a problem, do not hesitate to contact us. Also, we would appreciate if you can spare a minute to rate WP Security Audit Log. We like stars! We don’t see an update listed as available in the wp-admin/plugins area. Is there a way to manually install the update? Sorry to hear that. Please send us an email on support@wpsecurityauditlog.com so we can help you with this.